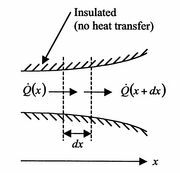 Equation (16.14) or (16.15) describes the temperature field for quasi-one-dimensional steady state (no time dependence) heat transfer. We now apply this to an example. Equation (16.18) is an expression for the temperature field where and are constants of integration. For a second order equation, such as (16.16), we need two boundary conditions to determine and . 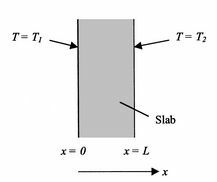 One such set of boundary conditions can be the specification of the temperatures at both sides of the slab as shown in Figure 16.4, say ; . This linear variation in temperature is shown in Figure 16.5 for a situation in which .